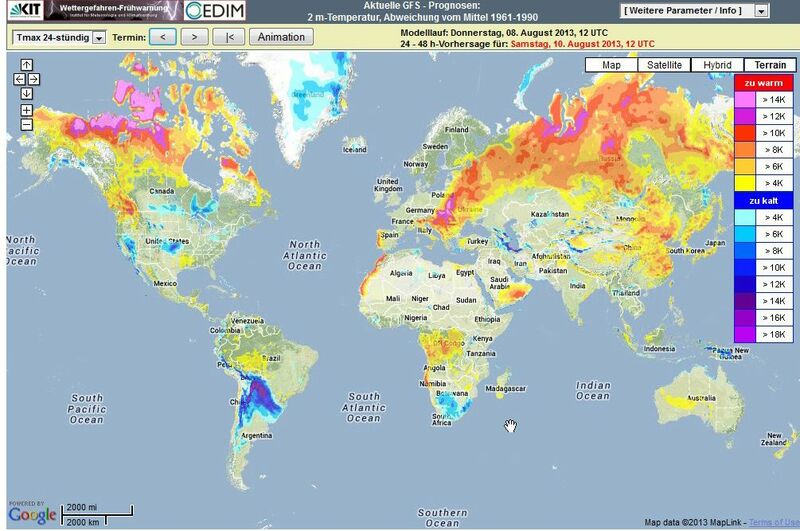 As of Friday August 9th, the heat wave in eastern Asia continues but in central Europe it has subsided. Some of the highlights below. This map illustrates quite well where the core of the heat wave in China has taken place. It is dated August 1st, so you can now add 9 more days to number of days of "continuous high temperatures" which means days of 35°C+ (95°F+). Map from the Chinese newspaper 'Global Times'. On Wednesday August 7th Shanghai once again broke its all-time heat record with a 40.8°C (105.4°F) temperature, besting the record set just the day before (40.6°C/105.1°F), and also on July 26th. Prior to this summer, the record for Shanghai was 40.2°C (104.4°F) during the summer of 1934. Records in Shanghai date back to 1872. On August 8th the temperature peaked at 40.2°C (104.4°F) and the minimum temperature was a blistering 31.8°C (89.2°F), perhaps the city's hottest night on record. In Hangzhou, China's 13th largest city, the temperature hit 41.6°C (106.9°F) today (August 9th), breaking yet again its all-time record set just yesterday. Hangzhou has now had 11 days of 40°C+ (104°F+) heat so far this summer. Prior to this summer, the city had only measured 40°C+ twice in its entire period of record, which goes back to 1956. Eight days this summer have equaled or beaten its previous record high temperature of 40.3°C (104.5°F) set on August 1, 2003. Even more astonishing is the 43.5°C (110.3°F) measured today (August 8th) at Ningbo City (Fenghua station). This site is almost right on the coast of the Yellow Sea and its previous record high was just 41.1°C (106.0°F). This would appear to be the warmest temperature yet measured anywhere in eastern China since the heat wave began in early July. The heat has also been felt in Japan and South Korea where Ulsan (South Korea) reached its all-time record with 38.8°C (101.8°F) on August 8th, and Songjeong 39.6°C (103.1°F) on August 9th, just 0.4°C short of South Korea’s national record high of 40.0°C (104.0°F) set at Taegu on August 1, 1940. In Japan, Okinawa tied its all-time record high with a reading of 36.1°C (97.0°F) on August 7th at Nanjo (tied with Ibaruma on July 8, 2012). At least seven other sites in Japan have broken their all-time heat records. Taipei, Taiwan measured 38.3°C (100.9°F) on August 8th, just shy of its all-time record of 38.8°C (101.8°F). The most dramatic story of the day, however, is the re-emergence of the heat wave in central Europe (with a vengeance!). Final figures are not yet in, but today (August 8th) has most likely been the warmest on record for much of the region. Austria has (again) set its all-time national record with three locations passing the 40°C (104°F) mark (no site has ever reached 40°C in Austrian weather records). The top hot spot was 40.5°C (104.9°F) at Bad Deutsch-Altenburg. The 40.6°C (105.1°F) reading at Neusiedl/See has been disallowed. Austria’s former national record was just set last week on August 3rd with a 39.9°C (103.8°F) at Dellach im Drautal. Slovenia has also surpassed its national heat record today (August 8th) with a 40.8°C (105.4°F) reading at Cerklje ob Krki (please don’t ask me how to pronounce this!) Former record was 40.6°C (105.1°F) at Crnomelj on July 5, 1950. Ljubljana, the capital of Slovenia, has passed its all-time heat record for five of the past six consecutive days with the highest reading being 40.2°C (104.4°) on August 8th (records go back 163 years to 1850!) Previous to this summer, the record was 38.0°C (100.4°F) in June of 1935. Wildfires have erupted in Bosnia and Greece. A rhinoceros is hosed down at the Warsaw zoo where temperatures peaked at 37.0°C (98.6°F) on Thursday, August 8th, the warmest temperature ever measured in the city. Photo by Czarek Sokolowski/AP. Hungary: 40.6°C (105.1°F) at Gyor on August 8th (national record is 41.9°C (107.4°F) at Kiskunhalas on July 20, 2007. It would appear that Budapest has broken or come very close to breaking its all-time heat record with a 39.4°C (102.9°F) reading today. Croatia: 39.8°C (103.6°F) at Karlovac with unofficial readings as high as 45°C (113°F) reported. National record is 42.8°C (109.0°F) at Ploce on August 5, 1981. As of Friday August 9th the heat wave has subsided in Europe and more record temperatures are unlikely for the time being. In spite of a brief intense cold snap in July, Bolivia, Brazil, Paraguay and Argentina are experiencing unprecedented winter heat. Temperatures have averaged more than 10°F above normal for the past month with readings as high as 103°F in Brazil and Bolivia, 100°F in Paraguay and 97°F in Argentina. The very unusual circumstances of heat alerts in the middle of winter have been issued in some locations. KUDOS: Maximiliano Herrera for much of the above information. Thanks a lot for the just in time coverage, Christopher! Somehow 'unbelievable' doesn't satisfy when one tries to describe the intensity of recent heat waves. I wish flat maps like that would do a better job at NOT distorting the size of the far latitudes in terms of areal size. Just a pet peeve in general for all maps that do that. That's a good point astrometeor. 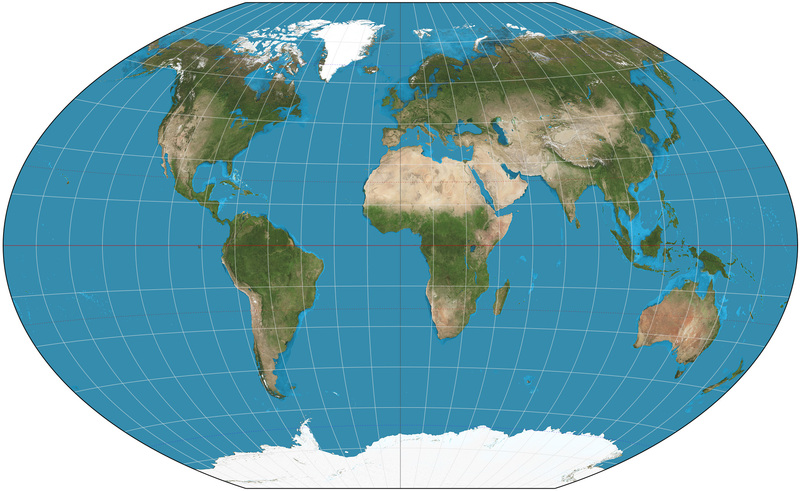 Flat maps depicting the surface of a sphere must distort shape or area, and sometimes both. Here is the Robinson projection that does a better job with area although not perfectly. National Geographic now uses the Winkel projection. 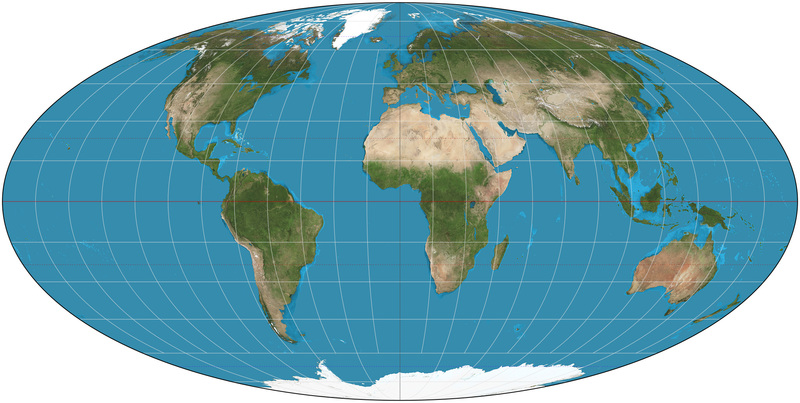 The Mollweide projection is equal area. Chris, IIRC Shanghai is typically fairly humid. Any idea what the heat index is like? Around 50-55C. Some areas might have touched peaks of heat index near 60C. The data check from ZAMG (Austrian weather service) has shown that the value of 40.6 degrees in Neusiedl am See is not meteorologically realistic. It is deleted from the database, an external influence was suspected. Thus, the record 40.5 degrees C(= 104,9F), measured in Bad Deutsch Altenburg stands. Another scorcher in Korea today, but the national record hasn't fallen yet. One northern suburb of Ulsan reached 39.6 degrees today, though, which is getting really close, and the city itself made it to 38.4. I'm surprised that the record is only 40.0 degrees, as summer temperatures in places like Daegu are often well past 30.
with a more typical summer there? So I'll raise the question again. What's different this summer compared with a more typical summer there? Before anyone can answer you, I think you first need to define where you mean by "there". "There" meant China. Since other continents and countries were specified you are right, I should have been specific. I'd consider position of the stagnant, deep-layer ridging as primary factor, using the period July 25 thru Aug 7 for analysis it's been nosing in from the W Pacific, centered right over the East China Sea... Ridge is farther west, typically located more to east over W Pacific. Wind flow from surface to 500 mb has drawn from SE Asia / South China Sea, further advecting high humidity at the surface while combined with subsident regime aloft. I haven't had time to research it too extensively, but this year's pattern differs from the 2010 heat wave (specifically in regards to China) when appears the ridging focused more over continent, affecting more northerly regions than this summer's heat wave and it's half-over-ocean / half-over-land position. If interested, research and compare various parameters of climo, mean, anomaly values from ESRL... and further, NOMADS GFS archives (as currently available). FAIRBANKS, Alaska – The temperature hit 80 degrees for the record 36th time this summer on Thursday in Fairbanks, and, only 1.44 inches of rain has fallen in Alaska's second-largest city since June 1, according to the National Weather Service. That's 2.25 inches below normal and makes this summer the fourth-driest on record, meteorologist Ed Plumb told the Fairbanks Daily News-Miner (http://bit.ly/1czUw74 ). There is no precipitation in the forecast for the next week. "We're not getting any August weather any time soon," Plumb said. August is normally the wettest month of the summer, but the Alaska fire season still is cooking. Korea is a Peninsula fully surrounded by the sea in three cardenal points therefore the air is very humid. There are two unofficial temperatures above 40C in South Korea. North Korea has a national record of 40.9C in the extreme north, which is in the continental part. Note the minimum temperatures above 30C yesterday, I have checked the main heat waves in Korea and i found no other cases of minimum temperatures above 30C. Thanks. Anomolously dry soils may also have contributed though that would not explain the hotter nights. Excellent. China is just part of the picture. The heat is affecting Japan, Taiwan and Korea as well. If there were buoys between ... and there are some! So I checked Station 22107. Night is just ending there (1900 GMT is 5 AM Korean time) and the air temp is 85.8F with water temp of 85.3F. The water temp earlier in the last 24 hours was over 86F. This site is not in a bay somewhere. It is out in the East China Sea off the island Jeju. Still that is not out of line with temps in the Gulf of Mexico such as here. Great update as usual, Christopher!